"A hose protection product used to help safeguard hose covers from abrasions and cuts. Typical areas of use include agriculture, logging,construction and "	mining applications. 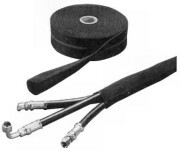 The abrasion sleeve is also useful for binding two or more hose assemblies together, in addition to the protective qualities the sleeving provides.